The armed resistance of the Movement of Democratic Forces of Casamance (MFDC) against the government of Senegal is the longest running active separatist movement in Africa. Since 1982, MFDC rebels had been fighting for independence for the southwestern region of Senegal between The Gambia and Guinea-Bissau, known as the Casamance, primarily targeting military installations, convoys, and personnel in an attempt to destabilize the region. Civilians living and traveling in the Casamance had been targets of opportunity for the rebels and bandits that support the group. Foreign visitors should be cognizant of the border between Senegal and The Gambia and make a concerted effort not to accidently stray into the Casamance. By the new millennium, the situation was being described as ni paix ni guerre. Fortunately, neither the Casamançais nor the ethnic Diolas became targets of discrimination or violence in northern Senegal. Wagane Faye observed "... the MFDC insurgency has fundamentally remade itself twice, both times in response to successful government initiatives to cut off its support base. From a popular grievance-based insurgency in the 1980s, it transformed itself into a proxy force of neighboring countries during the 1990s, and then into a resource-driven movement after the turn of the century. As the MFDC has shifted from one support base to another, it has pragmatically altered tactics and objectives.... " Senegal’s 30-year-long conflict in the Casamance had become a stalemate — a debilitating condition of neither war nor peace that is being fueled by a “war economy” interlinked with a variety of illicit actors, most of whom were not Senegalese. The “war economy” in the Casamance created incentives that were a major impediment to the peace process. Illicit activities include marijuana cultivation and illegal logging, with the logs and the marijuana being exported out through Gambia, and the laundering of money from the transshipment of cocaine through Guinea-Bissau to Europe. With few natural resources and a per capita income of $500 per year, Senegal is one of the poorest countries in the world. Unless it can create the conditions to unlock the productivity of its people and, in so doing, create jobs for thousands of unemployed youth, improve access to education and health care, and give people hope for the future, the country risks falling prey to the despair and demagoguery that had destabilized many of its neighbors. Tropical Senegal is lauded for its natural beauty, from its urbane capital, Dakar, to the fertile forests and farmlands called the Casamance. The lush landscape contrasts with the vast deserts that surround Senegal. The country brings in more visitors than any other country in the region. The physical environment in the south is somewhat different than the northern regions of Senegal. Largely as a result of higher annual rainfall the forest is much more considerable in the Casamance. Still the year had very distinct wet and dry seasons. The forest, as a result of the dry season, is more sub-tropical than jungle type forest, but still there were some areas with very large, old trees and areas with palm trees and vines, etc... The temperature in general is quite warm (between 30 - 40 degrees Celsius) though in Dec. and Jan. at night it cools off enough to need a light blanket. 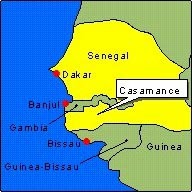 Most of the French Senegal rubber came from Casamance. From 1896 to 1899 inclusive the average production of rubber in Casamance amounted to 252,936 kilograms annually, valued at 940,222 francs. For the whole colony the average production in the period 1896-1899 was 278,005 kilograms, worth 1,084,219 francs. The rubber was derived from two species of landolphia, the most common known as toll, the vines of which grow in bushes on the plains and clearings. The latex was extracted from the roots. Although rubber has been cultivated in Casamance wince 1883 there is no system of protection or propagation, and unless precautions are taken there was danger that the plant will disappear. Independent Senegal was dominated by the Socialist Party, which had held power since independence. President Abdou Diouf, who had been in office since 1981, was succeeded in early 2000 by the newly elected president, Abdoulaye Wade. In 1996 the Socialist Party won control of all 10 regional governments and many local governments in the country's first subnational level elections, which were marked by credible allegations of widespread fraud and procedural irregularities, gerrymandering, illegal fundraising, and voter list manipulations. Due in part to the flaws in these elections, the Government's decentralization program had limited success in defusing the secessionist rebellion in the Casamance region. The Casamance region is an important focus area for the economic development of Senegal due in part to its rich tropical environment. The region is centrally located to facilitate trade with neighboring countries and had some of the largest traditional markets in Senegal. At one time, Casamance was also well known as a major tourist destination in Senegal. 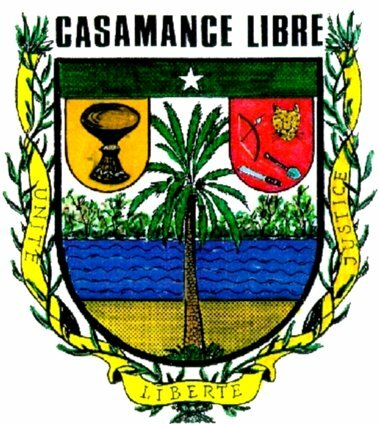 Currently, a major constraint affecting development in the Casamance region is its armed separatist struggle that led to a sharp decline in the economic and social well being of the population.